The new DLS 8.6.1 release is now available! The latest release of DLS is now available for customers that have been experiencing issues with the previous 8.6 release. Please use the below links to download the DLS installer. What is the DYMO Label Web Service? How do I install the DYMO Label Web Service? Double-click on the installer and follow the directions provided by the install wizard. Double-click on the DMG file to mount it. Select the newly mounted volume and double-click on the PKG file found within it. Then follow the directions provided by the install wizard. How can I tell if I have DYMO Label Web Service installed? The DYMO Label Web Service is installed as long as you have installed DYMO Label Software 8.5.3 or newer using the express “Express” mode. If installed, there will be an executable file named DYMO.DLS.Printing.Host.exe within the DLS working folder (normally found within the C:\Program Files (x86)\DYMO\DYMO Label Software folder on Windows and the /Library/Frameworks/DYMO/SDK folder on Mac). How can I tell if the DYMO Label Web Service is running? You should see the DLS application icon within the system tray. Right-click this icon to display a context menu. The menu displays the web service’s status (i.e., “Started on port 41951” or “Stopped”). The following shows what it looks like on Windows. I do not see it in the system tray. How can I start it? You can start the web service again by navigating to the DLS working folder and running the executable named DYMO.DLS.Printing.Host.exe. Open a Finder window, navigate to the /Library/Frameworks/DYMO/SDK/ folder, and click on the DYMO.DLS.Printing.Host.app icon. How can I start or stop the DYMO Label Web Service? You can start or stop the web service at any time by open right clicking on the service’s icon in the system tray and choosing the Start service and Stop service menu items, respectively. Although API functions will not execute after stopping the service, the service icon will remain in the system tray after stopping it. 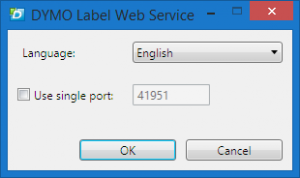 How can I configure the DYMO Label Web Service? Clicking the Configure menu item will cause a configuration window to appear. This allows you to change the language and listening port. The web service will normally try to use the first available port within the 41951-41960 range. You can override this behavior by checking the Use single port checkbox, which makes the service only try using the specified port only. You cannot specify a port number that does not fall within the specified range. The service will not try using any other port if an error occurs while using this option. How can I tell if the DYMO Label Web Service is functioning properly? Click the Diagnose menu item within the context menu while the service is running. If the self-test succeeds, a dialog box will appear asking you to open a test page in your browser to see if SSL certificate is working. The port number may vary from machine to machine. The library invokes this callback whether or not initialization completes successfully. Although it may work with old unmodified code in some cases, it is highly recommended to make a few changes to avoid future problems. What will happen if I leave my old code unchanged? The library now makes use of a new initialization method to perform asynchronous initialization through use of a callback method. Since the library performs initialization in the background, calling an SDK function prior to initialization results in an error. Your code should be updated to call the new dymo.label.framework.init() method while providing it a callback to be invoked by the library when initialization completes. Please note the library invokes this callback whether or not initialization completes successfully. If initialization is asynchronous, are other methods asynchronous as well? How do I make use of Promise objects in asynchronous programming? As with all other SDK-related methods, do not call checkEnvironment() until init() finishes initializing. Synchronous library initialization and web service discovery will occur if it is called before init() completes. Purpose: Returns a document object model (DOM) for label file. It is necessary to use the label.getLabelXml() or label.toString() functions to obtain XML representations of a label. Purpose: Returns a graphic representation of the label (PNG) encoded in base64 format. Purpose: Prints a label on the specified printer. When using this code, you will see which steps the library takes every time it attempts to initialize (i.e., synchronous vs asynchronous initialization, port number if web service is discovered, fallback implementation selection, etc.). Synchronous XMLHttpRequest on the main thread is deprecated because of its detrimental effects to the end user’s experience. How do I perform error logging? Improper DYMO Label SDK usage or multiple unexpected external factors may result in errors. You may need to retrieve logging data in these cases to help resolve problems. To see communication errors and service fault messages, you will need to open Developer Tools (invoked by F12 key in most browsers) and open “Network” tab. If you see erroneous response in the list, you can click it and look for details in adjacent window (look and position is browser-specific). Response body would normally contain error description. If you are performing some specific tests, we recommend you delete the existing log before making a test run to eliminate any unnecessary log messages. Should you use our DLS or SDK installer? There has been a lot of confusion out there among our developers as to whether they should use the DLS installer or the SDK installer within apps that make use of our DYMO printers. Let’s try to clear this up as it isn’t immediately obvious what each installer is used for. Our DLS installer contains everything needed to integrate printing functionality within your app. This is what needs to be installed in order for your apps to work. The SDK installer, on the other hand, contains documentation and samples that describe how to make use of the functionality found within the DLS SDK. The “SDK installer” isn’t really named appropriately and will probably be renamed in future releases for the sake of clarity. Hopefully, that clears things up a bit. I hope everyone enjoyed their holidays! We have had a number of issues reported, several of them were big enough that we decided to release an 8.5.3 patch version that fixes the issues that were found. Reference the following posts for additional set up information. Keep in mind that the Web Service is built into this version of DYMO Label so the standalone install is no longer required. Thanks for all the great feedback! Let us know of any issues found, we’ll continue to give the best support we can. We are proud to announce the release of DYMO Label software version 8.5.3 for Windows. Reference the following posts for additional set up information. Keep in mind that the Web Service is build into this version of DYMO Label so the standalone install is no longer required. We also know that you are interested in the Mac version. We have had a lot of issues getting the design to work on Mac OSX, we have hit a major milestone this week and we now have a release candidate for DLS 8.5.3 for the Mac. If everything passes, we should be able to release it within a work week. As a note to all our patient customers, we really appreciate you and your patience. This has been a more difficult release than we had thought but it is finally happening. All we have now is the imminent MacOSX release. Thank you! The good news is that we are currently testing our new communication protocol and it will be ready for a Beta release soon. We have worked hard to make sure that the new SDK will be backwards compatible. There will be the addition of an initialization method, but the existing API works the same. Our new SDK will utilize TCP/IP to communicate between the browser and a Windows service running on the client machine. The new service will be installed with DLS when upgrading to the new version. A range of ports will be available for our windows service, if the browser cannot bind to one of the ports, it will fall back to our legacy plug-in architecture. For additional security, the service will accept connections only from localhost. Stay tuned to this blog for more information.